Heather and her husband, Nathan, are raising their son in the same North Deering neighborhood where they grew up. A former public school teacher and attorney, Heather now owns and runs Rising Tide Brewing Company in Portland. Under Heather's leadership, Rising Tide has created two dozen jobs and helped spur the revitalization of the East Bayside neighborhood of Portland. Rising Tide has been committed to giving back to the community, with significant on-going support for the Maine Island Trail Association, the Good Shepherd Food Bank, Full Plates Full Potential, Portland Trails, and many other organizations. Heather has also served for many years on the Portland Development Corporation board, a quasi-municipal organization that administers the city's economic development revolving loan funds and job creation grant programs. As a successful small business owner and industry leader, Heather led the charge to modernize Maine's brewery laws, leading directly to the creation of hundreds of good paying jobs. Since being elected in 2016, she has emerged as a leader in the Maine House of Representatives. 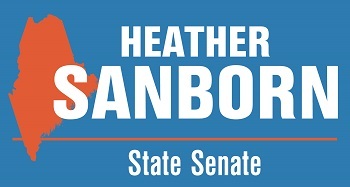 Heather will to bring her leadership skills and problem solving abilities to the Maine Senate to continue to help move Maine forward. Heather is running for the Maine Senate because she wants to ensure that Maine is a place where her son, and all of our kids, will be able to thrive -- receiving a great education, finding a great job, and raising our future grandkids here in Maine. Too often, politicians in Augusta have focused on the struggles of the past rather than envisioning a bright future and then putting in place the policies that we need to get there. When Heather was eight months pregnant with her son, her husband was laid-off from his job. Not only did the family lose his paycheck, they also lost their health insurance coverage. Fortunately, they qualified for MaineCare and were able to access quality medical care without bankrupting the family. A few years later, Heather began working at a large company that provided top quality health insurance coverage for its employees. She still ended up receiving expensive care in the emergency room because of inefficiencies in our healthcare system. Now, as a small business owner, Heather spends countless hours each year evaluating health insurance plans to determine which ones she should provide to her employees. Heather's varied experiences with our health insurance system have given her a unique perspective on the ways in the system is broken. She is currently the co-chair of a legislative task force that is looking to find ways to fix what's broken. She strongly believes all Mainers should have access to quality, affordable healthcare and is fighting hard find ways to make our healthcare system work for all Mainers. In the wake of yet another school shooting, we need to do all that we can to ensure that our children are safe when they head off to school in the morning. This includes common sense gun reforms, such as banning high capacity magazines and bump stocks, improving and expanding background checks, raising the age to purchase a gun to 21, and providing for "red flag" orders to take away guns from those who may be a danger to themselves or others. As a former public school teacher, Heather knows the importance of investing in our children's futures by providing strong funding for our public schools. The state should pay its fair share to ensure that the burden of paying for education does not continue to drive up property taxes, causing a struggle for seniors who want to stay in their homes. Global warming, and sea level rise in particular, is a crisis that we cannot ignore. We must embrace clean energy solutions, like solar and electric vehicles, that will reduce our reliance on fossil fuels. As Maine's population ages, we will face a shortage of workers that could stall our ability to grow our economy. Maine should be a leader on implementing family-friendly policies, such as universal pre-K and paid family leave, that will attract young people to move to Maine and make their lives here. Heather has helped lead a successful effort to ensure that Maine women will have affordable access to preventative care and contraceptives by putting those protections in state law. By putting them in state law, Heather has helped to ensure that women will continue to have access to care, regardless of what happens at the federal level. Every Mainer should have access to affordable, high quality healthcare. As the costs for healthcare continue to escalate out of control every year, we need to find innovative state-level reforms that can help drive those costs down.